February 1, 2011 /Photography News/ Forgotten your camcorder? There’s no need to worry. At the touch of a dedicated Movie button, the power-packed Cyber-shot™ HX100V and HX9V from Sony now offer Full HD video shooting. Recording video at 50 progressive frames per second (1920x1080 50p), both cameras can capture fast-moving action with exceptional smoothness and clarity. What’s more, both new H Series cameras are loaded with cutting-edge innovations by Sony to shoot stills, video and 3D with the quality you’d expect from a bigger, bulkier DSLR camera. Ideal for travellers and photo enthusiasts, the flagship Cyber-shot™ HX100V features a Vario-Sonnar lens by Carl Zeiss with T* coating on optical surfaces that virtually eliminates flare. This premium lens offers an ultra-powerful 30x optical zoom range for crisply-detailed close-ups of distant subjects. Comfortable to hold and carry, the camera’s styling echoes the body shape and control layout of larger DSLR designs. Smaller and lighter still, the HX9V offers a high-performance G Lens with powerful 16x zoom range with 24mm wide angle to accommodate virtually any photo opportunity. Despite their powerful zoom range, HX100V and HX9V can capture crisp, blur-free images with significantly reduced handshake, even while you’re walking along. Featured on both cameras, Optical SteadyShot with Active Mode is a powerful image stabilisation system with ‘3-way shake cancellation’ as found on premium Handycam® camcorders by Sony. You’ll be rewarded with clearer results when you’re shooting handheld, even at telephoto settings where camera shake is most pronounced. The HX100V and HX9V offer a choice of 3D shooting options with 3D Sweep Panorama, 3D Still Image and Sweep Multi Angle. In another Cyber-shot™ first, the 16.2 effective megapixel Exmor R™ CMOS Sensor inside both cameras supports a brand-new Intelligent Sweep Panorama HR (High Resolution) mode. Just press the shutter button and sweep the camera: Cyber-shot™ captures huge panoramic images with an incredible 10480x4096 resolution. Both cameras offer speedy shooting responses you might expect from a DSLR camera. High-speed autofocus locks onto subjects in as little as 0.1 seconds, letting you grab the most fleeting photo moments with ease. DSLR-like shooting options are further broadened by Background Defocus mode. The HX100V and HX9V can automatically combine two successive frames captured at different focus settings when the shutter is pressed. These are combined to yield a professional-looking image with crisply-focused foreground subjects against a smoothly blurred background. The advanced imaging possibilities of both H Series cameras don’t compromise fuss-free operation. Superior Auto mode recognises a wide range of shooting conditions, automatically adjusting settings and shooting a high-speed burst of multiple frames as required in low-light conditions. These are automatically combined within the camera to create beautifully-exposed, low-noise results with virtually any subject – even in challenging low light conditions without flash. Ideal for travel, holidays and more, both cameras feature an enhanced GPS/Compass function that captures your location and shooting direction. See the results after shooting as exciting online maps with any PC. The Cyber-shot™ HX100V also features a manual control ring that can be assigned as desired to adjust focus or zoom. It’s ideal for applications like macro photography, where focus can be adjusted precisely while viewing a magnified portion of the image. There’s a choice of elegantly styled carry case options for HX100V and HX9V with a quality leather-like finish. Giving easy access to your camera, the special design avoids electromagnetic interference with the GPS/Compass function of both cameras. Compatible with the HX9V and several other Cyber-shot™ models, the latest Party-Shot™ IPT-DS2 is a docking base that automatically shoots smiling, relaxed portraits of everyone in the room. The new model features enhanced styling, touch sensitive activation for ‘on demand’ shooting and support for Intelligent Sweep Panorama with compatible Cyber-shot™ models. Supplied with a protective cover and a tripod. 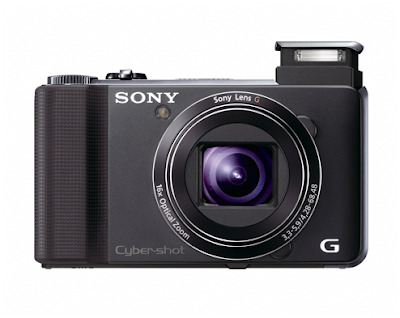 Also new from Sony, the Cyber-shot™ W520 teams superb image quality with simple, uncluttered operation. Light and compact, the W520 features a 14.1 megapixel CCD sensor, 5x optical zoom lens with 25mm wide angle, a 6.7cm/2.7" Clear Photo LCD, Sweep Panorama and Intelligent AUTO. 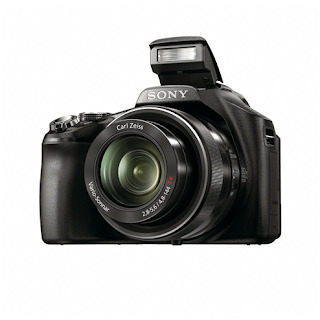 All new Cyber-shot™ models are compatible with the latest range of premium-quality SDHC cards by Sony. The perfect partner for your Cyber-shot™, they’re also a great match for SD/SDHC-compatible cameras, camcorders and devices from other manufacturers. The affordable Essential Series and value-added Experience Series are joined by the flagship Expert Series (Class 10) for photo users who demand class-leading capacity and transfer speeds. Personal Space™ is the network service by Sony that makes it easy and secure to share photos and video clips captured on your Cyber-shot™ camera. Upload your images from any Internet-enabled PC with the cameras’ supplied Picture Motion Browser software, or using pre-installed PMB Portable software. An email sent with an embedded link ensures that invited family and friends – and no-one else – can view your pictures. Videos and photos shared via Personal Space™ can also be viewed on Android smartphones such as the Xperia™ by Sony Ericsson or iPhone, via a dedicated application that can be downloaded from the Android Market or App Store. Xperia™ users can also upload images directly to their own Personal Space™ from their smartphone. 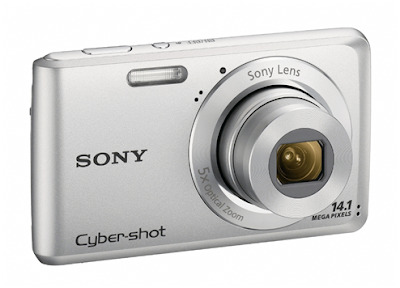 The Cyber-shot™ W520 compact digital camera will be available from March 2011. The Cyber-shot™ HX100V and HX9V will be available from April 2011.